Yeah, OK, I know the place is formally called “Rangers Ballpark in Arlington”, but after the debacle that was the Ameriquest Field stuff, when we went back to what it is, I decided to just use the old name. There. 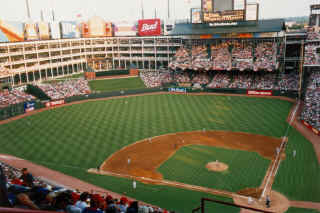 The Ballpark in Arlington is the home of the Texas Rangers, and has been since it opened at the start of the 1994 season. During the 2004 season, the naming rights were whored out sold to the Ameriquest Mortgage Company, and the ballpark was officially renamed to “Ameriquest Field in Arlington”, although no real fans called it that. Before the 2007 season started, it was announced that the agreement with Ameriquest was terminated, and that starting in 2007, the park would officially be known as “Rangers Ballpark in Arlington”. Close, but not the same. I don’t know any fans who will use that name. Really. “The Ballpark in Arlington” it remains. Despite all the things team management has done to it (really plowed on the advertising, changed the name to Ameriquest Field, screw up the field by putting college tournaments there DURING the baseball season, let Chuck Morgan go away for a season, let some sections of seats and cement fall into disrepair), it still remains a great place to watch a game. Having grown up in Veterans Stadium in Philadelphia, I have to say this place is a palace compared to that old (and no longer existing) place. Arlington Stadium was the home of the Texas Rangers from their first season here in 1972 through the end of the 1993 season. It previously existed before that as “Turnpike Stadium”, and housed non major league baseball during that time. The stadium was demolished in 1994 after it’s replacement was opened. If you’re familiar with the movie Bull Durham, there’s a Texas Rangers connection to old Arlington Stadium. Right near the end of the movie, there’s a scene where Tim Robbins’ character is being interviewed on TV. Well, the ballpark they’re doing that it in is Arlington Stadium. I didn’t recognize it all the times I’ve seen it before, but I watched the movie on DVD with the Director’s commentary on. Well, I was wondering if he’d say where the big league park I knew was at the end of the movie really was, so I was looking for any kind of landmark. I saw a billboard that looked suspiciously like the WBAP one with the Texas flag in it, and sure enough.. The director said “This was filmed in Texas in Arlington Stadium, before the new stadium was built”. The Texas Rangers even get a thank you in the end credits. If you’d like to see some screen captures from Bull Durham, check out this page in my photo gallery. Below is a diagram of the wall layout of the Ballpark in Arlington.